I keep seeing the yellow cover of the Oppositions Books edition of Rossi’s Architecture of the City and I always have the same quick reaction, that leap in my heart when I hope they’ve finally come around to re-issuing “Spoken into the Void”, the book of Adolph Loos essays republished as a collection in 1982. 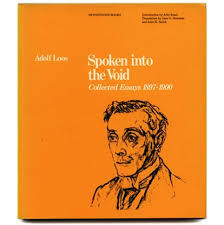 Spoken into the Void was my introduction to Loos’s writing. There was of course the classic Ornament and Crime, but that might be my least favorite of his essays, his witty and catty personality is on more full display in Poor Little Rich Man and The Principle of Cladding. Beginning in the mid-1980’s there was a revival of interest in Loos, who fit into a more ambiguous modernity that seems closer to what used to be called postmodernism, but now is called nothing and just is. The re-examination of Loos in Raumplan vs. Plan Libre, including an essay by the excellent Beatrice Colomina, brought the work under the lens of academic criticism and, as often happens, seemed to push a direct reading of the primary source further away. In any case it’s a book I wish would be republished and more widely available. On that last point, it seems that as a consequence of being younger, poorer, and not realizing that some things are available only for a fleeting time, I find myself looking for books which just don’t exist for less than $200 anymore; Anthony Vidler’s “The Writing of the Walls” or Fritz Neumeyer’s “The Artless Word”. Instead of these, or excellent general surveys by Tafuri & Dal Co or Banham we get Taschen. Where exactly is that world we were promised of everything available everywhere – it doesn’t seem to exist, even behind a pay-wall.